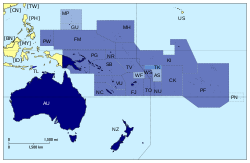 Membership (dark blue) of the Pacific Islands Forum. If the Forum considered as a single state. The Pacific Islands Forum (PIF) is an inter-governmental organization that aims to enhance cooperation between countries and territories of the Pacific Ocean. It was founded in 1971 as the South Pacific Forum (SPF). In 1999, the name was changed; "Pacific Islands Forum" is more inclusive of the Forum's Oceania-spanning membership of both north and south Pacific island countries, including Australia. It is an observer at the United Nations. Australia and New Zealand are generally larger and wealthier than the other countries that make up the rest of the forum, Australia's population is around twice that of the other 17 members combined and its economy is more than five times larger. They are significant aid donors and big markets for exports from the other countries. Military and police forces as well as civilian personnel of Forum states, chiefly Australia and New Zealand, have recently been part of regional peacekeeping and stabilization operations in other states, notably in Solomon Islands (2003–) and Nauru (2004–2009), under Forum auspices. Such regional efforts are mandated by the Biketawa Declaration, which was adopted at the 31st Summit of Pacific Islands Forum Leaders, held at Kiribati in October 2000. In August 2008, the Forum threatened to suspend Fiji if the latter did not commit to holding a general election by March 2009. Subsequently, at a special leaders' meeting of the Pacific Islands Forum held in Papua New Guinea in January 2009, Forum leaders set a deadline of 1 May, by which date Fiji must set a date for elections before the end of the year. Fiji rejected the deadline. Consequently, on May 2, Fiji was suspended indefinitely from participation in the Forum with immediate effect. Toke Talagi, the Chair of the Pacific Islands Forum and Premier of Niue, described the suspension as "also particularly timely given the recent disturbing deterioration of the political, legal and human rights situation in Fiji since April 10, 2009". He described Fiji as “a regime which displays such a total disregard for basic human rights, democracy and freedom” which he believed contravened membership of the Pacific Islands Forum. Talagi emphasised, however, that Fiji had not been expelled and that it would be welcomed back into the fold when it returned to the path of "constitutional democracy, through free and fair elections". The Secretary General of the Pacific Islands Forum Secretariat is appointed to a three-year term by the leaders of the member states. The Secretary General reports directly to the national leaders and the Forum Officials' Committee (FOC). The Secretary General also automatically serves as the permanent chairman of the Council of Regional Organisations in the Pacific (CROP). After the trade agreement goes into force, countries commit to removing tariffs on most goods by 2021. As of April 2008, The Forum Island Countries are also negotiating an Economic Partnership Agreement (EPA) with the European Union. It is important to note that the PICTA discussed here covers only the trade of goods. At the Forum Island Leaders Meeting held in Rarotonga, Cook Islands on 28 August 2012, nine members signed the Pacific Island Countries Trade Agreement Trade in Services (PICTA TIS). 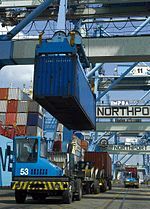 As of April 2008, there is an ongoing negotiation to design and agree on a protocol to include trade in services and the temporary movement of natural persons (a broader concept than the GATS's Mode 4). At the 19–20 August 2008 Pacific Islands Forum meeting in Niue, the leaders discussed Pacific Plan priorities including, “fisheries, energy, trade and economic integration, climate change and transport, in addition to information and communication technology, health, education, and good governance.” Leaders also discussed the impacts of climate change and adopted the Niue Declaration on Climate Change. Restoration of democratic governance in Fiji was discussed as were consequences should the interim government fail to meet established deadlines. Regional assistance to the Solomon Islands and Nauru was discussed, followed by discussion of radioactive contamination in the Marshall Islands from US government tests. Regional institutional framework issues and WTO Doha round developments were discussed, followed by discussion of country-initiatives and the Pacific Region Infrastructure Facility launched 19 August 2008 to provide up to A$200 million over four years to help improve infrastructure in Kiribati, Samoa, Solomon Islands, Tonga, Tuvalu and Vanuatu. The United Nations announced that it would partner with Samoa to develop an Inter-Agency Climate Change Centre to help Pacific island nations combat the impacts of climate change in the region. In the 2013 forum, the Marshall Islands, supported by all other Pacific nations, claimed compensation from the United States for the nuclear tests conducted on the islands during the 1940s and 1950s. In September 2016, the Pacific Islands Association of Non-Governmental Organisations (PIANGO) regional network, encouraged member states’ leaders to include in the organisation's agenda the issue of human rights violations in West Papua. ^ "Demographic Statistics - Prism - Pacific Statistics". Retrieved 14 January 2017. ^ Unattributed. "About Us". Pacific Islands Forum web site. Pacific Islands Forum. Retrieved 2008-08-23. ^ "American Samoa's Tulafono pleased to be part of Pacific family". Radio New Zealand International. 2011-09-09. Retrieved 2011-09-16. ^ a b c d "Forum Communiqué, Pohnpei, Federated States of Micronesia" (PDF). Forty-Seventh Pacific Islands Forum. Pacific Islands Forum Secretariat. 2016-09-10. Retrieved 2016-09-15. ^ "Solomon's Prime Minister says all Forum members backed suspension threat". Radio New Zealand International. 24 August 2008. Retrieved 1 November 2011. ^ "Chair of Pacific Islands Forum says Fiji has been suspended". Radio New Zealand International. 2 May 2009. Retrieved 1 November 2011. ^ a b c "Fiji suspended from Pacific Islands Forum". Xinhua News Agency. 2009-05-02. Retrieved 2009-05-02. ^ "Fiji isolated after election deadline expires". Australia Broadcasting Corporation. 2009-05-01. Retrieved 2009-05-03. ^ a b "Forum Communiqué, Alofi, Niue" (PDF). Thirty-Ninth Pacific Islands Forum. Pacific Islands Forum Secretariat. 2008-08-20. Retrieved 2008-08-22. The Niue Declaration on Climate Change is Appendix B of this document. ^ "Tokelau happy as forum associate member". Pacific News. Radio New Zealand International. 2016-09-27. Retrieved 27 September 2016. ^ Unattributed (2008-08-22). "Decision on Wallis bid to join Forum (as Associate Member) deferred". Latest Pacific News Headlines. Radio New Zealand International. Retrieved 2008-08-22. ^ "Land area rankings". The World Factbook. Central Intelligence Agency. Retrieved May 9, 2018. ^ "United Nations" (2010 Data). ^ "Page Not Found - Pacific Islands Forum Secretariat" (PDF). Archived from the original (PDF) on 31 May 2013. Retrieved 14 January 2017. ^ a b "Page Not Found - Pacific Islands Forum Secretariat" (PDF). Archived from the original (PDF) on 30 May 2013. Retrieved 14 January 2017. ^ Gao (2008-08-22). "Fiji ministers "angry" at Pacific Islands Forum's suspension warning". World. Xinhuanet. Retrieved 2008-08-23. "Australian Prime Minister Kevin Rudd said Pacific leaders were losing patience with Fiji's interim government. He said Australia will mobilize any resources necessary to restore democracy to Fiji." ^ Unattributed (2013-09-19). "Nuclear contamination still an issue for Marshall Islands". Radio Australia. Retrieved 2013-09-19. ^ Unattributed (2013-09-19). "Marshall Islands minister unhappy with John Key nuclear response". Radio New Zealand International. Retrieved 2013-09-19. ^ "Geo Politics At Play Over Leader's Lack of Expressed Commitment on West Papua". PIANGO. Retrieved 30 September 2016.